Prickly and Bitter: BLOG RERUN: Happy Diwali! With over a billion people of the world celebrating Diwali, and with it being the single most important holiday to Indians around the world, there is an enormous demand for decorations. Just like North Americans decorate for Christmas or Hanukkah (or whatever else you celebrate), Indians decorate for Diwali. And like any true Indian celebration, A LOT of flowers are involved. In fact, there are so many flowers involved in any Diwali household celebration that the demand for flowers in India skyrockets; a flower arrangement selling for 30-50 rupees on any non-Diwali day would sell for between 700-900 rupees tomorrow. I encourage you to name any other commodity in the world whose value increases that much over such a short time, just to fall right back down to what it was all within a week. There are people in India who make their entire year's salary in one week. 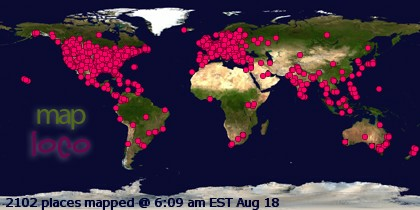 It's an incredible phenomenon! So how does this relate to marigolds? Well, quite unusually, it turns out. Normally, the celebration of Diwali involves decorating the ground in a specific pattern with rose petals. Because of the unfavourable weather earlier this year, roses are in short supply compared to what they usually are, and on a day like Diwali when there's a surge in demand, flower suppliers just can't keep up. They knew well in advance that there would be no way they could meet demands, and so substitutes needed to be made. Marigolds were always popular flowers around Diwali because of their colours, but this year they became extra valuable. The value of marigolds increased almost one hundred-fold for this year's celebration alone! Could there be a day that climate change causes a huge shift in how festivals like Diwali are celebrated? Perhaps. The flower supply market in Kenya, one of the leading producers of carnations, roses, gerbera daisies and baby's breath worldwide, has already started to suffer as a result of increased incidence of drought. While the temperature is not expected to change much (only 2-3 degrees Celcius by the year 2100; compare that to a projected 7-8 degree change for the Arctic), the incidence of severe weather patterns is expected to increase. Drought will be more widespread and worse than it is now, and when there is drought relief it is expected to be in the form of violent storms. Not exactly weather conducive for flower growing, in a greenhouse or not. 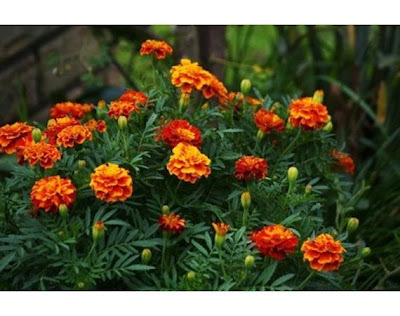 Marigolds themselves are some of the most highly praised garden plants worldwide. They are native to North and South America depending on species, but were spread worldwide for ornamental plant use by early world explorers. Marigold petals are added to a wide variety of food items for the golden colour they give off, especially when fed to chickens. It brightens the colour of the egg yolk and makes the egg appear (to humans; chickens don't care about the colour of their yolks) to be more nutritious even though the nutrition hasn't been changed at all. 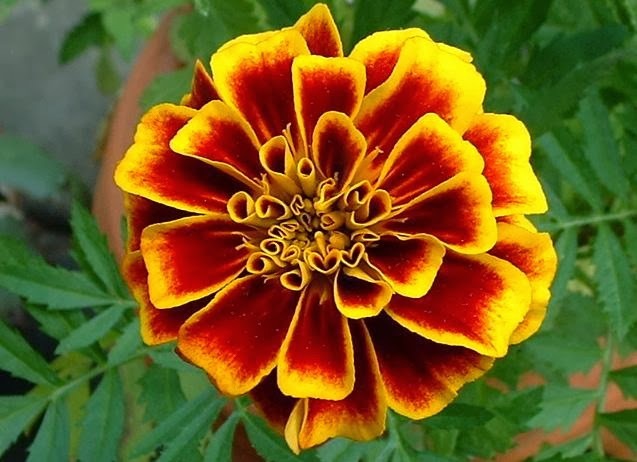 Marigold petals are also popular in herbal teas to balance out the bright pink colour of so many other herbal tea ingredients (like rosehips or hibiscus petals). 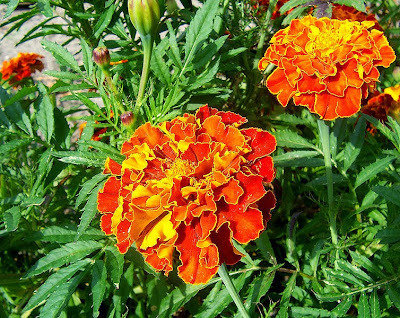 The roots of marigold plants are full of antifungal and antibacterial chemicals called thiophenes, which are starting to be investigated as chemicals of possible medicinal value. The roots have been used for centuries by Native South Americans as treatment for fungal infections of their agricultural crops with moderate success. Unfortunately, North Americans and Europeans found out this antimicrobial effect the hard way; when planted near legumes, which rely very heavily on microbial activity in the soil, the yield of the crop decreases dramatically. The scent of marigold flowers is so pungent that it repels a wide variety of crop predators, and so can be useful when planted beside non-legume crops like tomatoes, potatoes, eggplant and peppers. The flowers of the marigold plant also attract pollinators, some of which will also eat insect parasites of crop plants like aphids. A great story of insect-plant mutualisms! Labels: antimicrobial, butterflies, climate change, common, Diwali, economic bubble, edible plant, fungal disease, insect mutualism, marigold, medicinal plants, non-native species, parasitic wasp, pollination, Tagetes sp.